Something we’re going to do for the first time this year is to send quick snaps and small updates through WhatsApp. I’ve hired a ‘Pocket Wifi’, a device that is connected to the cellular networks and offers a wifi signal. So we should be able to use data on our devices during our whole trip. This makes it viable to just pop off a quick snap in between, which should be fun. We’ve made a read-only group, so that only the both of us can post — don’t want to have it devolve in a lot of pointless chatter. I also updated the Raspberry Pi that I use as a VPN server, and installed all the client software on all devices that we will be using. This way, when we use public wifi signal, we can tunnel to our own Raspberry Pi — so there will be no way to eavesdrop on our communications. Small chores, indeed, but important to us. I’ve written about streaming games here before. Watching and interacting with streamers and their community on Twitch.tv has given me a lot of good moments. One streamer and his community even became good friends, and we did meet up and had a good time. Some of the people in his community have (re-)started streaming themselves, and watching them is a lot of fun too: no matter what the game, it’s good to hang out in chat. So I got that itch to stream too. I used to, but the only machine that is capable of running games is in the living room (it’s an AMD A10, with integrated graphics), and that means slogging a lot of infrastructure to and fro. And I couldn’t add a face-cam to the feed, because it would also show the living room (with klik on the couch behind me). And then I realised that I still had an A8-based system, complete with motherboard and memory, just collecting dust in the attic. The A8 is the smaller sister to the A10, but it’s powerful enough to play videos, which is what we use the living room computer for mainly. So why not swap out the A10 for the A8, and build up a small system to sit on my desk? That way, I can have the infrastructure semi-permanently in place, and I can use a webcam to more directly interact with my viewers (if there are any…) and hide the rest of the house behind a chamber screen. So in between the Scylla of Christmas and the Charybdis of New Year’s, I ordered some parts, build up a system, ordered some more parts, returned another part, installed, installed and installed some more software, ordered some parts again… The things never seem to work out the way you intend — though perhaps I could have been better prepared by comparing several measurements. But in the end, I built up a small little desktop with the A10 and a fanless(!) GTX 1030 card. I need to do the streaming itself through klik’s laptop, but after configuring it all (mostly syncing the facecam and the microphone up with the video feed from the game machine), I have a neat little setup from which I can stream. It’s a lot of fun, especially with the usual suspects dropping in and hanging out in chat, commenting on the gameplay or on general occurrences. I don’t have a schedule, but I’ll stream when the fancy strikes me. If you’re wondering what it’s all about, you could drop on by on my Twitch.tv channel and follow me there. Saturday I went to my parents’, to help my father with his printer — or at least, to try again to get it to work with his laptop after a Windows 10 install. No matter what I tried, we couldn’t get the driver installed. And without the driver, the printer doesn’t work (duh)! Looking online, there were people who got it to work with the newest driver package, but also people who couldn’t… And the error message when trying to install the driver said something about not being able to install kernel drivers. I googled on this message, and it turns out that drivers need to be signed through Microsoft before they can be installed on Windows 10. And of course HP hadn’t done that. And here’s the kicker: that setting is disabled when it’s an upgrade from Windows 7 or 8 to 10. That explained why some people could get it to work (they were on an upgraded system) and some could not (because they had a clean Windows 10 install). My dad, on a clean Windows 10 install, had this activated! There was a workaround: you could turn it off in the Group Policy Editor. But there was another catch: my father runs Windows 10 Home, which doesn’t include this tool… And the advice of people in the know is not to try to add the tool to a Home edition because it will seriously mess things up. So that prompted more googling, which yielded a spreadsheet which details which policies translate to which Registry settings. Somehow I found the right setting, flipped that bit, and suddenly I could install the driver! It was fun to see my parents and have lunch with them and the like, but this whole thing was seriously un-fun! At least it’s resolved now. Yesterday we went to visit klik’s mother, to help her with her printer. We advised her a cool double-sided printing colour laserprinter, because she sometimes has to do large print runs. However, it was very slow to print — we’re talking 12 hours for 20 pages! She lives at the north side of the Veluwe, the most forested area of the Netherlands. 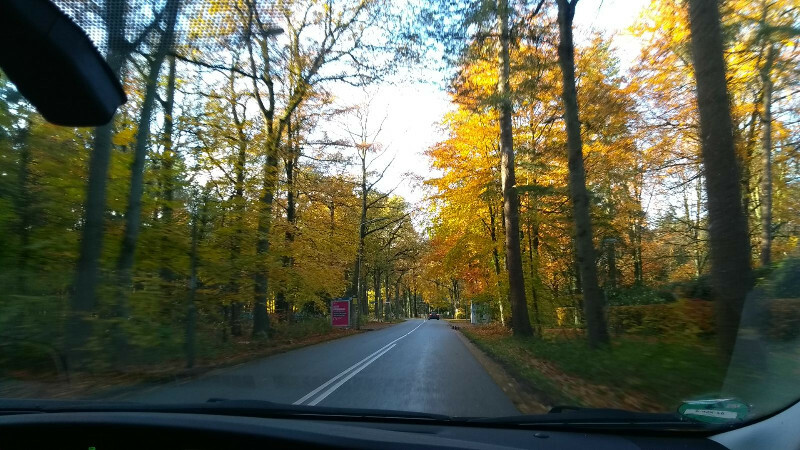 It started all off with pines being planted to provide struts for the mines in Limburg, but after those were closed down, the forests remained. It’s now slowly transitioning from “production forests” to more natural forests, with more diversity. It is also the area with the most wild deer and boars. 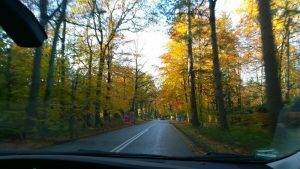 What with the fall colours, it was beautiful driving through the forest lanes! Here’s two crappy cellphone pics through the windscreen of a moving car to give you a little impression. The printer issue was ultimately ‘solved’ by using a USB cable instead of printing over wifi. We also had a great dinner at the Greek restaurant in town. 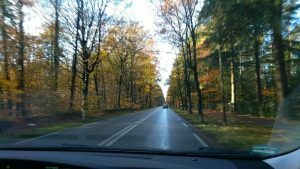 When we drove back home, through the dark, we talked about what would happen if we were to hit a deer or a boar on the road. Surely the car would be a total loss! To alert drivers to the wildlife, wooden cut-outs of boar and deer have been placed next to the road — but since we drive over that road often, we’re not impressed by that. So when we saw a boar rooting through the mud next to the road, we almost assumed that it was one of those cutouts! It stayed clear of the road, though, so there was no harm done. First time I saw wildlife there! When LiveJournal switches to https, I had to follow suit with my self-hosted blog too, right? I mean, how can I keep maintaining that my own solution is better when it’s still served over an unencrypted connection like a pleb? So I rectified that. You’ll automatically get redirected to a https connection too. The Raspberry Pi is so cheap and small that it can easily be used as an appliance. The Raspbian distribution is a full-fledged Debian, so you can basically use it for anything, which is pretty cool. And since it uses a micro-SD card as storage, you can easily swap out “functions” by swapping the card. So if one day you want to play retro games, you just put in a card with a RetroPie image and boot it up. And then if you want something else, just swap in the card that contains those programs, and off you go. Super convenient. When you’re out in public and using your telephone, your laptop or a tablet, you want to use public wifi to preserve some of your precious, precious data cap for that month. But we all know that public wifi is a security risk: man-in-the-middle attacks are easy to execute like that. Russian-backed hackers are targeting hotel wifi, in order to get user credentials and to inject malicious payloads. We’re going on holiday in two weeks. We’re staying at an apartment, and I don’t expect any hackers particularly targeting that apartment, but I’m not too fond of the idea of just connecting to the wifi there and then just seeing what happens. So, using this excellent guide, I set up a Raspberry Pi as an OpenVPN server. There’s an app for Android (for use on smartphones and tablets) and a Windows connector too (for use on the laptop). Really easy, and now we can use public wifi with confidence! So, I fully migrated to a self-hosted WordPress blog from my LiveJournal. In the process, I reconfigured WordPress to accommodate the features that I had on LJ. I like a clean and easy layout, so I selected the Myth theme. I stripped out anything I didn’t need/like, so it’s pretty bare at the moment — just how I like it. But LJ has some things that WordPress lacks. Most importantly, there is the usericon and the current mood (and the associated images). I wanted to replicate those in WordPress. First step was to create a child theme of Myth and to download all the usericons and the mood icons from LJ and put them in there. WordPress has ‘metadata’ key-value pairs which you can read in the PHP code, so I settled on using that as storage for these items. Using the Advanced Custom Fields plugin, I added a little side-bar for the metadata fields — with user icon and current mood selectable from a list. In my child theme, I read those fields and output the appropriate HTML in the post header. I used the Easy Spoiler plugin to create something like the equivalent of the LJ-cut: a text you can click on, which then expands part of the post. There is an official LJ-to-Wordpress migration plugin, but it doesn’t work and I don’t expect it will ever be fixed. So I was on my own. To migrate, I used ljdump.py to download all my entries — something I had been doing all along anyway. This yields a file for every entry (conveniently numbered L-1, L-2 etcetera) and the comments for that entry. The file is in XML format and contains all the information about the post — so also the usericon used, the mood and mood description, the post security etcetera. The official LJ export page doesn’t provide all this information! Then I wrote a Python script to parse those XMLs in batches of 200. If a post was public, then the script generated PHP code to create the entry and set the right metadata fields. I decided not to convert the comments — those comments were made by people on LJ, and there is no implicit permission to post those comments elsewhere. Of course, I also converted the LJ-cut tags to the Easy Spoilers. This yielded 19 PHP files, which I uploaded to the server and executed one by one by requesting their URL. (Yes, I have since removed them from the server, of course…) And after all that, my LJ was imported in WordPress! But I wanted to keep my LJ too, and crosspost from WordPress to LJ. After using a more generic crossposter, I settled on LiveJournal Crossposter plugin. It allows you to create a link back to the original entry, etcetera. It also supports setting the user icon and security settings, but that did not work to my satisfaction. I discovered that the plugin relies on post meta-data to set the cross-posting options. That’s not a bad idea at all, but if you immediately publish a post, the metadata may not have been set yet, and so all you get are empty strings! First saving a draft and then publishing works, and it’s an easy enough workaround that I’ve decided to just keep doing that. I also modified the code to use the user icon I set in ‘my’ metadata fields (instead of what was chosen in the plugin frame), and added the ‘current mood’ pair as well! I also added a little function to change the spoiler shortcodes into lj-cut tags! And that is where we are today. It works to my satisfaction, it’s self-hosted, and it crossposts the entries as if they were written on LJ instead on WordPress. Neuromancer was published in 1984. This was 2 years after the introduction of the Intel 80286 — so PCs were still in their infancy and so-called “home computers” were all the rage in homes everywhere. I think I got my first MSX computer then. The internet existed, but it was all text and all run on mainframes. Getting on the internet meant sitting in front of a terminal (or a PC that ran terminal software) and typing up commands. These mainframes ran VMS or a Unix variant, so you had to use arcane commands like “ls” instead of “dir”. Most terminals were monochrome and had a green phosphorous coating on the cathode tube — so all text was bright green. Applications that you interact with through this type of terminal are called “greenscreen” — sometimes lovingly, sometimes derisive. The first time I connected to the internet, which was much later, in 1991 — it was on an Adm3/a connecting to the server at 9600 baud. Actual computer work was done on the same mainframes. Four years later, in 1988, IBM released the AS/400 “midrange computer” — still a computer that required it’s own room, but less bulky than the mainframes that were used for really large calculations. The AS/400 became the workhorse of mid-sized companies for their administrative duties. It still is: we have lots of customers that are running insurance or policy systems on these machines. (I’ve also heard a rumour about Colombian drug lords kidnapping AS/400 systems programmers to force them to build applications to keep track of their illegal empire.) And here, too, greenscreen rules supreme — often as terminal emulators run on PCs, but even there the text is green. There are some systems to “convert” greenscreen applications to web applications, but that’s more like coating it with a little web sauce instead of actually converting. And this esthetic has stayed with cyberpunk. Look at the opening scene of The Matrix: even the WB and Village Roadshow logo are greenscreen. I’m participating in an online campaign of The Sprawl, called “Ashes to Ashes, Chrome to Rust” (which is streamed live through Twitch.tv — you can read my session reports and watch the videos linked from here). 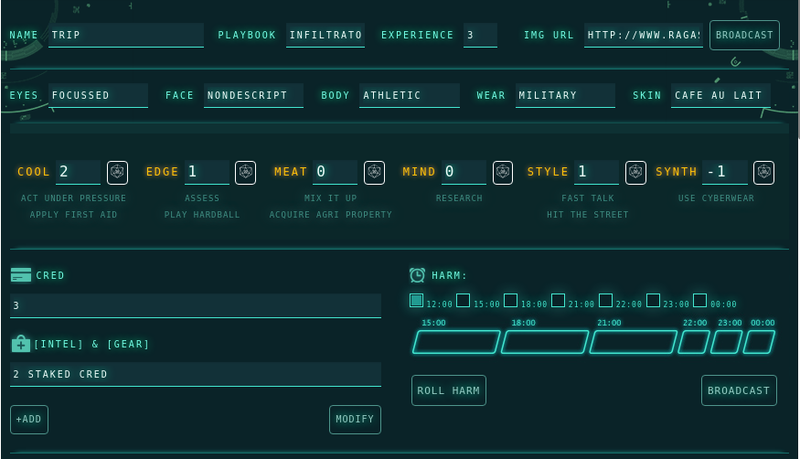 During the initial discussions we had about the ‘feel’ for the game we were going for, we decided to do ‘classic Gibsonian’ cyberpunk, reaching back to the rules and types of things that happen in Neuromancer. And one of the players, who is well-versed in design, created a really cool greenscreen-inspired layout, even with scanlines over our video feed. He also created a greenscreen GIF to promote the game on Twitter, and I really liked that. So I set to programming and created a Python script that uses the curses library to recreate the greenscreen, 9600 baud experience to emulate a system in our game. Setting up a terminal in Ubuntu to look like greenscreen is easy, and byzanz can record (part of) the screen and create a GIF out of it. The text is actually read from a command file, so that it’s now possible to create GIFs like this without coding. So somebody was selling their HDMI capture device second-hand, I made them an offer with a price I was prepared to pay for it, and they accepted! So after two days I had this device at home. I’ve been spending quite a bit of time setting it up… I game with a controller from the PC in the living room. That is connected to our TV with an HDMI cable, so I could hook that up to the capture device, which also acts like a HDMI passthrough. (There was something with resolutions though, but I got that resolved.) Then I hooked the capture device through USB up to klik‘s laptop, and now I have a streaming setup though her laptop! So I’ve been doing some streaming, and it’s great fun. I don’t get many viewers, but some of the people that I regularly watch on Twitch have subscribed and come to hang out, which is a lot of fun. And you can easily export videos from Twitch to YouTube, so it’s easy to get a playlist of your playthrough of a game (in case anyone is interested…). So you can now find me (mostly Wednesdays and Thursdays) on my Twitch.tv channel over at https://www.twitch.tv/fubfubfub. If you want to know when I’m going online, keep an eye out for my streaming-related Twitter account @fubfubfub. Drop in, say hi, watch me fail at games (mostly working on a Dark Souls II sorcerer playthrough). So I have been hanging out in various Twitch channels these past few months — mostly for streamers who play games I’m interested in or familiar with. Mostly Dark Souls II because I have been playing that one too, and because the gameplay makes it easy to drop in or out of a stream without missing essential plot development. I subscribed to some of those caster channels if I liked their personality and way of doing things and then stuck around as they moved on to other games. I even now play in an RPG campaign that’s streamed to a channel because of this. So, watching streams is kinda neat: the chat allows you to interact with the caster and the other watchers, and that can be a lot of fun. Not quite like sitting next to them on the couch, but it’s close to that, and much more convenient. 😉 And I play games too, so maybe I could start casting too? I’d need one bit of additional hardware, but we’d be set for the rest of the needed kit. But I’m not sure I should do this. Who would want to watch me fail at games? Most casters I follow have a set schedule and work kinda hard to promote their channel — that almost seems like work. I’m not going to do that. Also, I don’t have a dedicated room to game in: we have specifically chosen to put all the computers in the (extended) living room, so that we’d still be together if one of us is on their computer and the other is on the couch. In fact, when I game, I’m using the TV and klik might watch from the couch. I’m not about to share all of those domestic scenes with the world. But she works three evenings in the week… But do I really want to invest in something that might or might not work out? I’m just not sure. I’m interested, but I’m just not sure.